First time we heard name Belyi in 2009 from Nikolai Bandalet during joint Russian-Belorussian expedition on Kyzyl-Asker. At that time it was highest unclimbed peak of the Kok-Shaal Too ridge. In 2014 we came back to Kyzyl-Asker to finish our line there and won national championship with it, but from time to time we started discussion about new area for us and Belyi in particular. In December 2014 with expedition to Belyi region we won grant from Moscow mountaineering federation and preparation started. Due to economic issues in Russia we felt lack of finances and that was why I tried to invite more people to join us. Finally we had 9 team-members, 3 of them had never been before in mountains. During information collection we discovered that in 2011 Belyi was successfully climbed by Slovenians and our focus turned to virgin peak 5481 next to east from Belyi. There were 3 or 4 attempts but mostly due to bad weather or lack of time nobody really tried it. Expedition started from Moscow 31st of July 2015. - 3 unexperienced (Nikolai Andreev, Ekaterina Rachinskaya, Angelina Zelikova) with instructor Raslan Sharifullin - "Team-3"
- 1st team same from 2014: Dmitry Grigoriev, Sergey Nilov and Dmitry Golovchenko. Idea was that all 3 teams could work independently. For that purpose Grigoriev joined second team for acclimatization period, 3rd team were climbing easiest lines while me and Nilov were doing reconnaissance of major goal. One of unpleasant surprises: we found garbage with dates of 2010 and 2011 on glacier under South East face of the mountain. 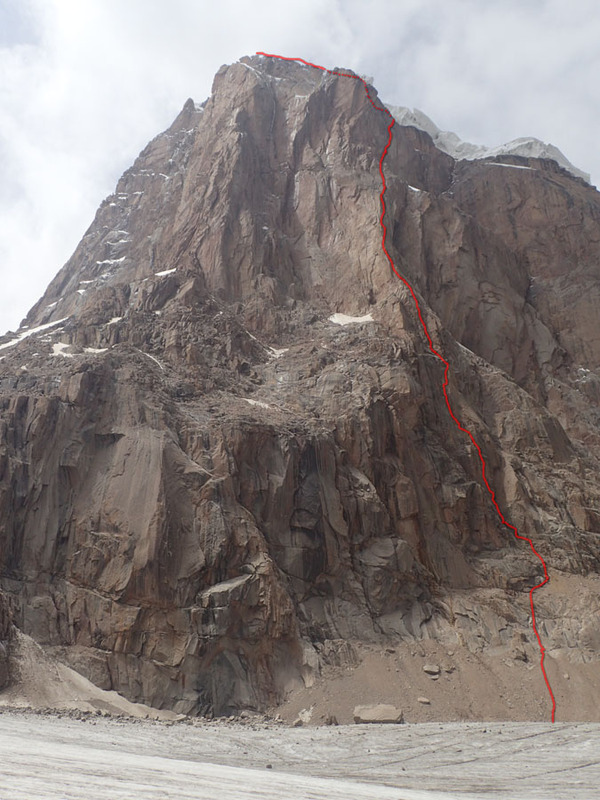 On August 8th Team-3 made first ascend on peak 4585 (1b Russian grade) and named it Tashgul, Stone flower. 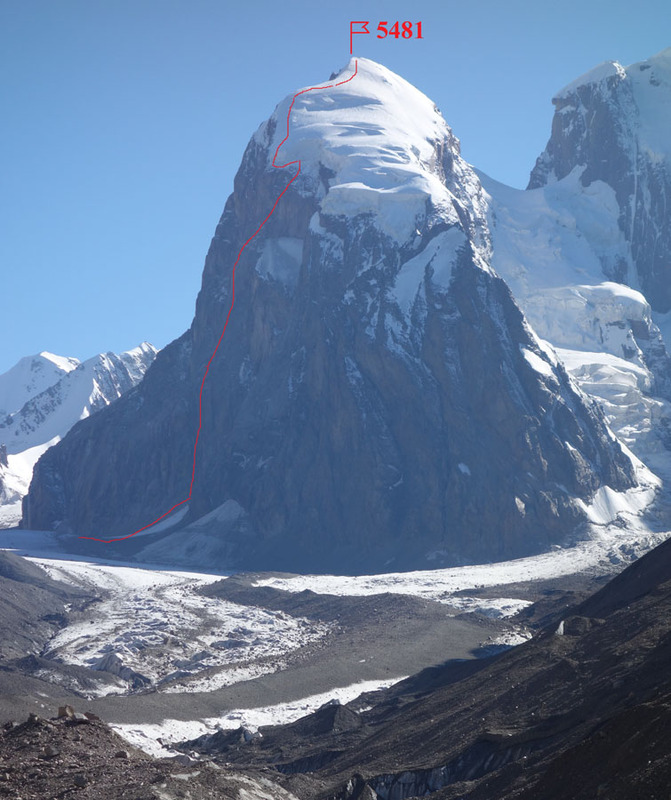 Same day Team-2 with Grigoriev first climbed peak 5020 and named it Gorin (in honor of Russian scientist). Russian grade 2a. 12 August. 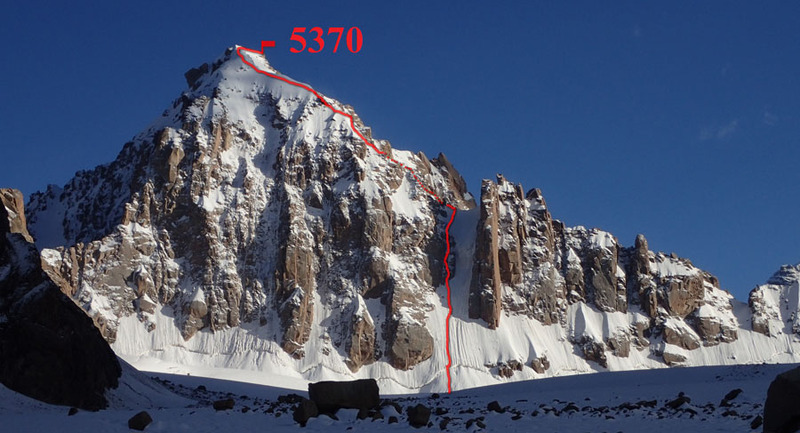 Team-2 extended (with Grigoriev) made first ascend on peak 4990, Pamyati Druzey (In friends memory ), 3a Russian grade, while Team-3 repeated line on Gorin. 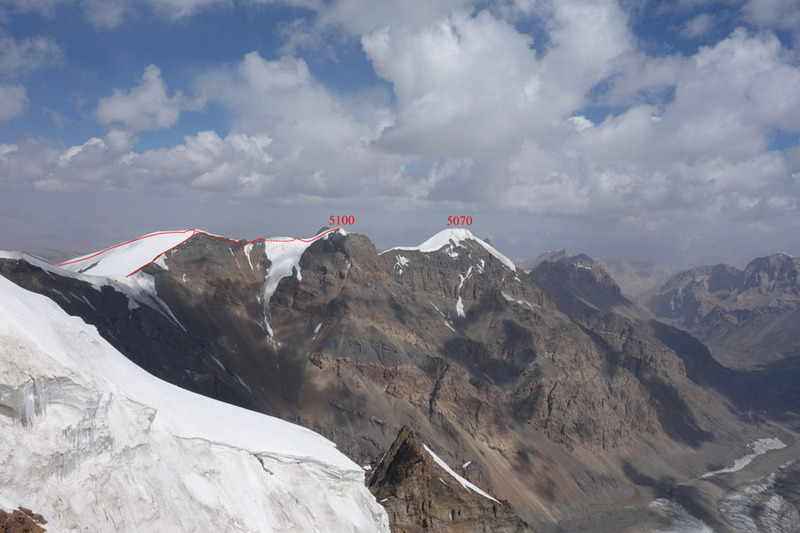 All these 3 summits are on Sarychat glacier. Same days pair Nilov-Golovchenko were looking at possible line and carried stuff to ABC. North-East wall was ed as most steep from one hand and safest from the other. 13 August. Dima Grigoriev has Birthday! We woke up early, prepared food, took 2 melons and run to peak Novey (4978), right above base camp. Team-1, Team-2 with Nikolai and Ekaterina. Storm caught us right before the summit and we had to wait while weather becomes better. Sitting under the rock we finished melon and pancakes. After storm went away we reached the top in full staff. 2b Russian grade. Later in base camp we had even a cake, prepared by Angelina and Ruslan. 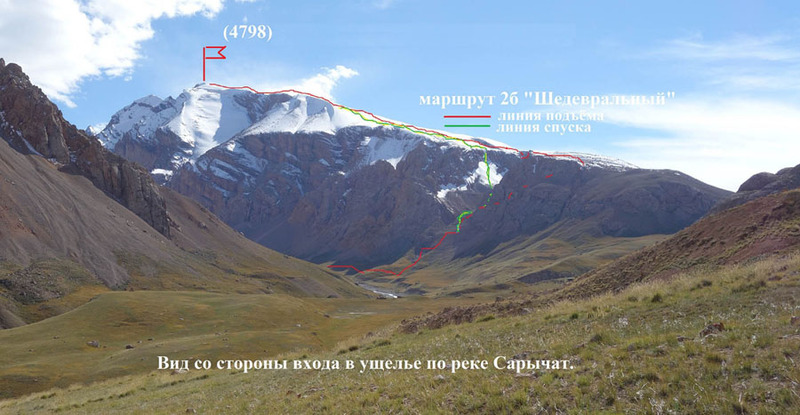 14 august 4 expedition members took horses to carry luggage and went down to hunter-camp Bulat-M and next day they were in Bishkek. 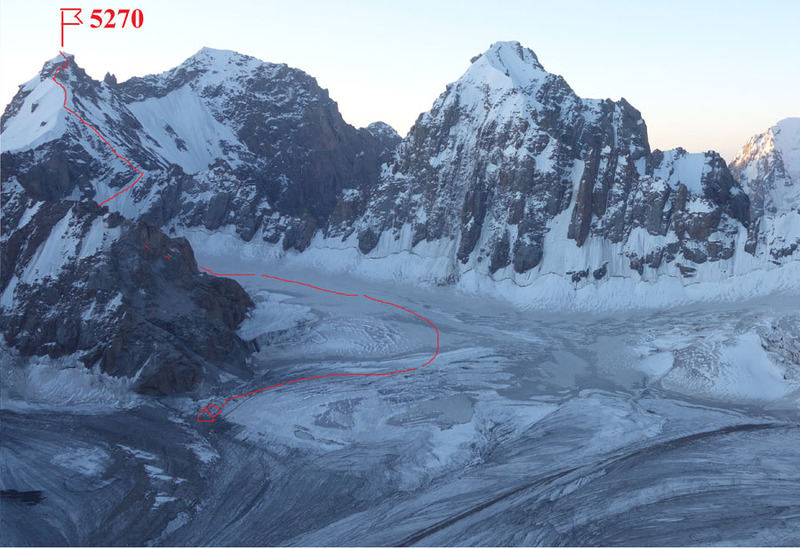 15 august Team-1 and new Team-2 (Vladimir and Ruslan) went from base camp to Fersmana glacier. 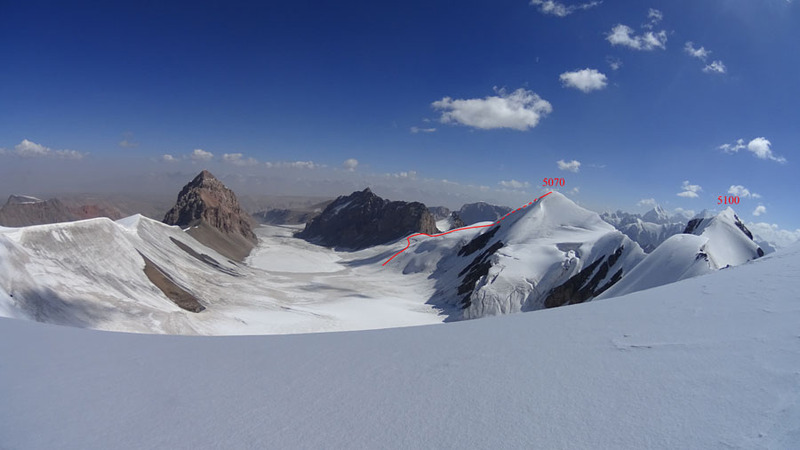 Next day Team-1 started new route on peak 5481 and Team-2 reached col to the North from Korsun peak near Belyi. 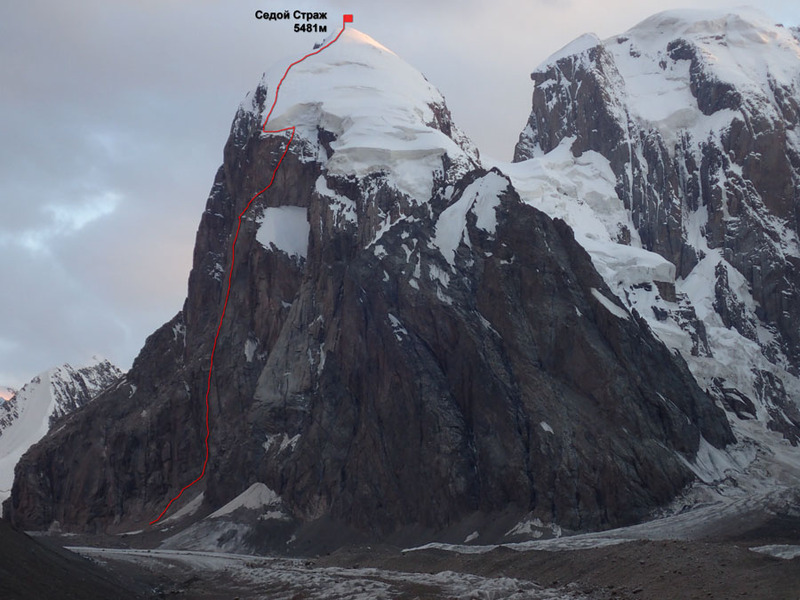 August 17th Team-2 reached unclimbed summit Chudo (Miracle), 5100 m and next day peak Prozrachnaya (Transparent), 5070 m both 2a Russian grade. 19th of august Team-2 went down on Malitskogo glacier and than turned right to base camp. Same day Team-1 reached roof and had wonderful night inside crack between rock and ice. Next day we traversed 80 meters to South and found colour leading to snow hat of the mountain. At 2 p.m. we were standing on the summit. Storm started and we had to spend there 2 hours before it gets was possible to see way down. Night in bergshrund and next day we were back on Fersmana glacier made not only first ascend but also traverse of the summit that we called Sedoy Strazh (Grey hair guardian). After 1 day of rest in BC we all went back to Fersmana glacier. This time our goals were 2 beautiful peaks, Granitsa (Border peak) and Pogranichnik (Board guard). We split on two teams: Golovchenko - Nilov - Sharifullin on Granitsa, Grigoriev - Nikitin on Pogranichnik. Next day there were snowing so we spent our time eating and making snow-woman. August 25th both teams got summits same time, around 6 p.m. and even had visual contact. Later snow started and we went back to ABC only at 3 after midnight. In fact on Granitsa we repeated polish line (second ascend) and on Pogranichnik made first ascend rated 4a Russian. As for our main objective Sedoy Strazh (5481) we rated or line with highest 6b Russian grade. Line is safest out of potential routes on NE wall and most difficult as South wall has lower slope. Great granite climbing with minimum aid climbing. And one of the most exciting camps in inside ice crack!